Who says insurers and reinsurers aren’t tech savvy? 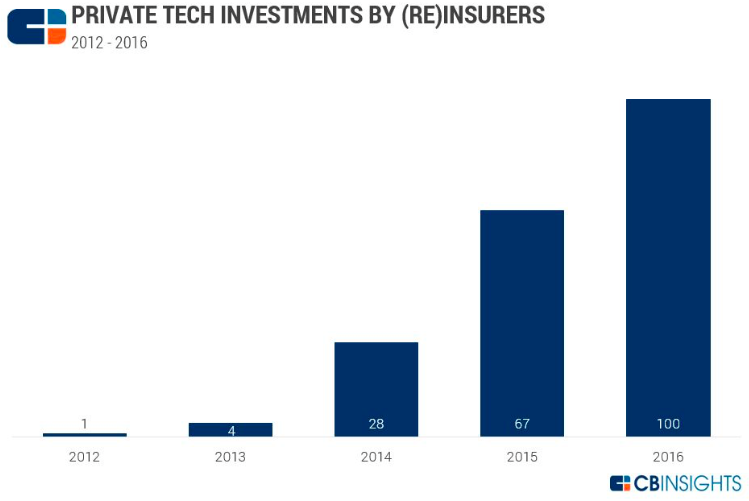 CB Insights reports that (re)insurers made 100 strategic investments in private tech companies in 2016, up from a single investment just four years prior. Wow, that’s an increase of 9,900 percent. Cybersecurity, digital insurance distribution, IoT and property management software are some of the tech areas where insurers and reinsurers are investing, according to CB Insights data. U.S.-based tech startups attracted 65 percent of (re)insurer investment between 2015 and 2016, while France, China, the United Kingdom and Germany also saw deals. Munich Re and HSB, XL Catlin’s XL Innovate, Liberty Mutual, Mass Mutual and Assurant are just some of the reinsurance and insurance companies investing in tech startups either directly or via their corporate venture arms. This is just one of the ways that insurers are leveraging technology, and more specifically data and analytics, into their business. At the recent Insurance Information Institute Joint Industry Forum, property/casualty insurance leaders identified technology as one of the most important issues for the industry in 2017. This post by the I.I.I. Insuring California blog talks about how Silicon Valley’s Plug and Play is connecting insurers with the startup ecosystem.